Dylan never needed a giant fake head! Frank is a movie so bizarre and strange that it’s practically a miracle it got made at all. 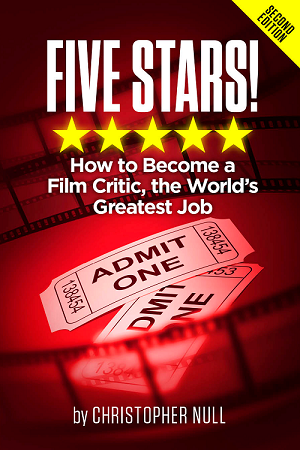 Aside from its eccentric subject matter, the film keeps the face of its most recognizable and bankable star obscured for the majority of its running time. One can only wonder about the reasons why anyone ponied up the cash to make it, but they did. And thank goodness for that. While by no means any kind of artistic masterpiece, Frank is a risk-taker. We don’t get nearly enough of those. The fact that it’s also (loosely) inspired by a true story only makes it that much more interesting. Domhnall Gleeson plays Jon, an aspiring songwriter who can’t seem to translate his many ideas into anything resembling good music. He stumbles into a job as a replacement keyboardist for a (very) progressive rock band called Soronprfbs (not a typo), which is fronted by the enigmatic Frank (Michael Fassbender). Although a seemingly nice guy and committed musician, Frank perpetually wears a massive paper-mache head, both onstage and off. He never removes it, even when showering. As the band begins recording an experimental album, Jon tries to find his place within the group, while simultaneously attempting to ascertain what kind of trauma fueled Frank’s unusual costume and musical inspirations. Questions regarding the head are quickly shunted aside. He also clashes with temperamental keyboard player Clara (Maggie Gyllenhaal). Through the power of social media, Soronprfbs is eventually invited to the SXSW music festival, which ends up changing their destiny forever. The biggest drawback of Frank is that it’s largely a one-joke movie. 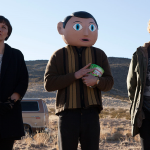 Frank wears his big head, which serves as a buffer against the outside world, yet attempts to write songs that reflect that world. 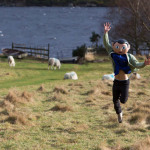 The movie has jokes about the ability of others to tell what he’s feeling (he often verbally describes his facial expressions), the lack of visibility afforded by the head, and the reaction of those who see Frank for the first time. Occasionally, the screenplay touches lightly on themes related to mental health, but it never really digs into them, mostly choosing to stick to the humor. Thematically, everything here is about as shallow as a kiddie pool, meaning that you won’t find any kind of meaningful emotional payoff. Fortunately, Frank is pretty funny. The movie’s one joke is good, and the comedy is wisely played completely straight. After a while, the mere sight of the head elicits laughs, because it is placed in increasingly inappropriate situations. Having Frank wear it on stage or in rehearsals makes sense as a piece of performance art; when he wears it into a restaurant, on the other hand, the thing takes on a whole new laugh-out-loud dimension. (How does he eat?) There’s also something humorous about the way many of the other characters simply accept this quirk. In real life, most folks would be a little self-conscious going out in public with someone dressed so weirdly. Frank’s cohorts accept this facet of his personality, which, when you think about it, makes them almost as odd as he is. Even the music is funny. Soronprfbs is an exaggeration of every kooky prog-rock band you’ve ever heard. Much of the credit for the movie’s success must go to Fassbender. Removed of the ability to use his face, he gives a full-throttle physical performance, conveying a range of emotions simply through the way his body moves or the manner in which he tilts that cumbersome fake head. He somehow makes up for the absence of facial expression through carefully calculated movement. Fassbender ensures Frank is a compelling character, not just because of his affectation, but because we can sense the insecure figure underneath. Gleeson is the other MVP. Under his care, Jon convincingly goes from being a hapless wannabe to a guy who finds some sense of himself. Even if there isn’t much substance to Frank, it’s hard not to respect its quirky approach to an already left-of-center story. The movie goes straight when you expect it to be humorous, and goes humorous when you expect it to be straight. It creates intentionally off-kilter moments that defy plausibility. It mocks rock star vanity, experimental music, and the very nature of personal expression. Frank, like its central figure, is deeply weird, but in that special way that you simply can’t avert your eyes from. 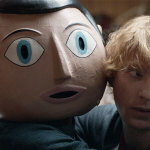 Special features on the Frank Blu-ray include deleted scenes, some behind-the-scenes segments, and audio commentary from director Lenny Abrahamson, actor Domhnall Gleeson, and music composer Stephen Rennicks.